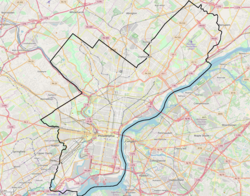 The Philadelphia Badlands is a section of North Philadelphia, Pennsylvania, United States, that is known for an abundance of open-air recreational drug markets and drug-related violence. It has amorphous and somewhat disputed boundaries, but is generally agreed to include the 25th police district. Usually, it is widely understood to be an area between Kensington Avenue to the east and Broad Street to the west, and between Hunting Park Avenue to the north and York Street to the south, mostly coinciding with the neighborhoods of Fairhill, Glenwood, Hunting Park, Harrowgate, Stanton, North Central, West Kensington, Hartranft, and Kensington. The term The Badlands was popularized in part by the novel Third and Indiana by then Philadelphia Inquirer columnist Steve Lopez. The neighborhood also was featured in several episodes of ABC's Nightline. The intersection of 3rd Street and Indiana Avenue was listed number two in a 2007 list of the city's top ten drug corners according to an article by Philadelphia Weekly reporter Steve Volk. The term Badlands was first used by Lt. John Gallo, who headed the East Division Narcotics Task Force. Its use spread, with many people attempting to take credit for the moniker. It was Gallo's work along with ASAC Billy Retton that worked about a dozen long-term investigations in the 25th and 26th Police Districts that preceded "Operation Sunrise". Open-air drug sales changed completely after this. Ted Koppel, Geraldo Rivera, 20-20 and 48 Hours all rode with Gallo at one time or another, and it was during this time that Gallo was able to make the name stick. At one time a center of heavy industry, much of the Badlands' urban landscape is now characterized by vacant warehouses and tightly-packed strips of brick row houses constructed for the working class of the neighborhood. Like most industrial cities, Philadelphia suffered economic decline following the movement of industry to developing countries and has suffered as a result. The Philadelphia Badlands contain a diverse mix of ethnicities. Puerto Ricans are the largest group, but the area also contains large populations of Black Americans, Irish Americans, and Dominicans. The area encompasses El Centro de Oro, the heart of Philadelphia's Puerto Rican community. Many drug users from surrounding upscale suburbs make the badlands their home and get stuck in the cycle of addiction which leads to homelessness. The term "Badlands" sometimes refers to the area's high concentration of street gangs of various ethnicities, and its abundance of open-air drug dealing and heavy users of drugs, especially heroin and cocaine. Although much of the area's crime stems from local neighborhood-based street gangs and the drug trade, larger, more organized gangs also operate in the area, including the Black Mafia, Latin Kings, and various motorcycle gangs. Aside from less-organized gang activity, the Badlands is also known as the founding location and current turf of the Irish-American organized crime group known as the K&A Gang (also known as the Northeast Philly Irish Mob). Circa 2012 Irish Americans constitute more than 12% of the population of the Badlands. The area's reputation has been countered by community activists and nonprofit organizations such as Centro Nueva Creación, which in 2010 conducted a summer children's program, "The Goodlands Photographers", aimed at helping young people photograph and display positive images of their neighborhood. ^ a b Volk, Steve. "Trouble Spots: Third and Indiana Archived September 11, 2012, at Archive.today". Philadelphia Weekly. May 24, 2006. Retrieved on January 19, 2009. ^ a b Martinez, Vanessa. "Child Photographers Find Good in the Badlands." Philadelphia Inquirer. August 13, 2010. Retrieved on August 17, 2010. ^ Volk, Steve. "Top 10 Drug Corners Archived September 7, 2012, at Archive.today". Philadelphia Weekly. May 2, 2007. Retrieved on January 20, 2009. ^ Asquith, C. (2007). The Emergency Teacher: The Inspirational Story of a New Teacher in an Inner-city School. Skyhorse Pub. ISBN 9781602391932. Retrieved August 27, 2015. ^ Wherry, F.F. ; Rocco, T. (2011). The Philadelphia Barrio: The Arts, Branding, and Neighborhood Transformation. University of Chicago Press. p. 187. ISBN 9780226894324. Retrieved August 27, 2015. ^ "In The Heart Of Gold | Hidden City Philadelphia". hiddencityphila.org. Retrieved August 27, 2015. ^ "Ambien for Coke Heads - The Daily Beast". thedailybeast.com. Retrieved August 27, 2015. ^ a b Pray, Rusty. "Against Odds, They Take On Drugs In Badlands On Every Corner, Dealers Sell. With Small Numbers, A Task Force Presses On Despite Risks". Philly.com. Philly.com. Retrieved December 1, 2013. ^ Celano, Donna; Susan B. Neumann (2012). Giving Our Children a Fighting Chance: Poverty, Literacy, and the Development of Information Capital. Teachers College Press. p. 13. Retrieved May 6, 2014. This page was last edited on 14 April 2019, at 07:02 (UTC).